It is advisable that you write your cover letter in a word processor. That will allow you to spell check your writing. Alternatively, a site administrator could install the spell checker for the editor. However, you should do the formatting in the editor window and not your word processor to avoid unwelcome formatting changes. 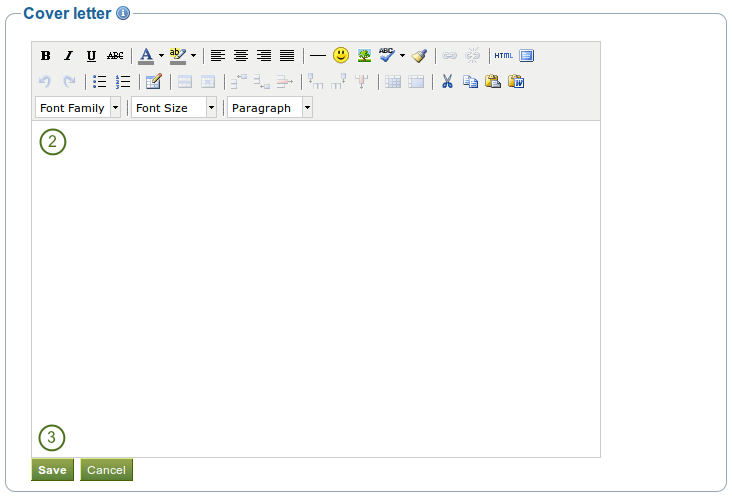 Click the Save button below the editor window when you are happy with your cover letter to save it for future use. If you write your cover letter or any other text in Microsoft Word, please use the Paste from Word button to strip out most of the formatting code that Word puts into a document but can interfere online. The process of creating an entry for your education history and your employment history is similar. Therefore, the process is explained only once. Fill in all the fields that are marked in red and with an *. These fields are required to have a minimum of information. 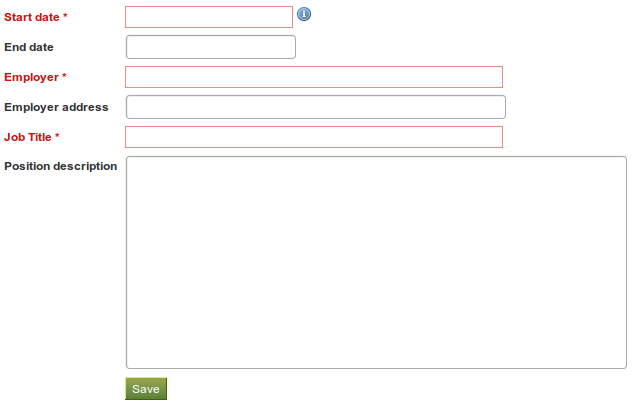 Fill in the other fields if they are relevant for you. Click the Save button right below the “Qualification description” / “Position description” to save your entry. Click the Add button to add more items. You can enter the dates any which way you wish. It is not a calendar date field because different résumés require different date formats. When you have filled in all your qualifications in your education history or all positions in your employment history, you can re-arrange the individual items if necessary. Use the up and down arrows to change the order of the individual items in your history. The start date is displayed as you entered it. The end date is displayed as you entered it. 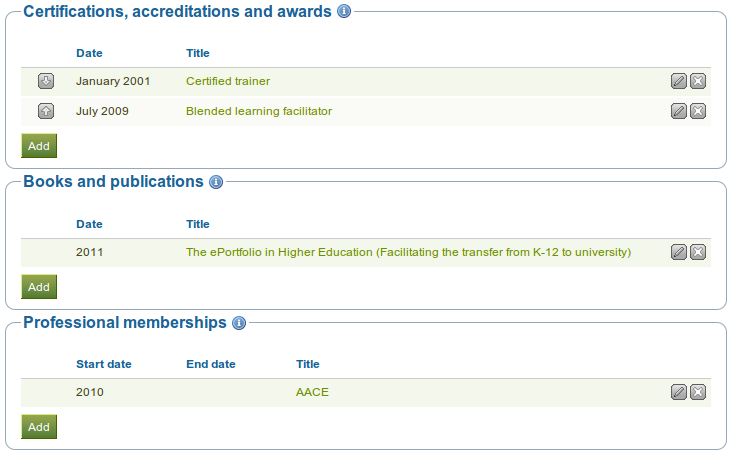 Your qualification / position along with the institution / employer is shown. Use the Edit and Delete buttons to edit the individual records or delete them respectively. 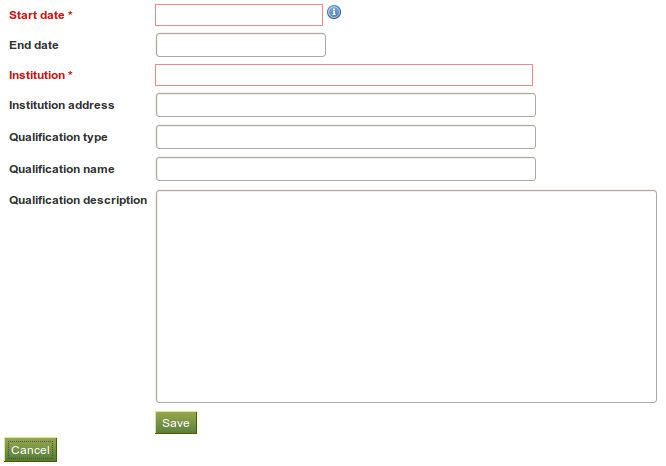 It is important to save each new entry using the Save button at the end of the form. Entries are displayed in a tabular format. Change an entry by clicking the Edit button . When you are finished, save your changes to return to this page. Click the Delete button to remove entries. If you have provided a description for your qualification, click your qualification’s name to view or hide this information. Click the Save button right below the “Description” to save your entry. Click the Delete button to remove an entry from your list. Click the title of your certification, accreditation, award, book or professional membership to see its full description. Write your goal description into the appropriate box and click on the Save button once you are done editing the respective box. You can come back at any time and edit your goals. Write your skills descriptions into the appropriate box and click on the Save button once you are done editing the respective box. You can come back at any time and edit your skills. Write your interests into the editor window and click on the Save button once you are done. You can come back at any time and edit your interests.